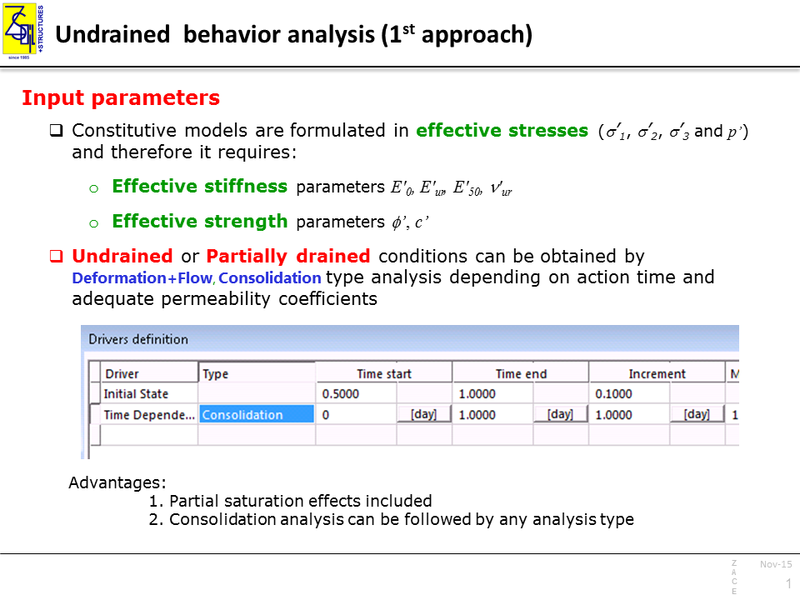 Why does the deviatoric stress tend to infinity when modeling undrained behavior with the Hardening-Soil model? This is because, in the original Hardening-Soil model formulation, the shear and volumetric plastic mechanisms are decoupled. The preconsolidation pressure pc, being the hardening parameter of the cap yield surface, depends solely on the accumulated volumetric plastic strain εvp produced by this mechanism. 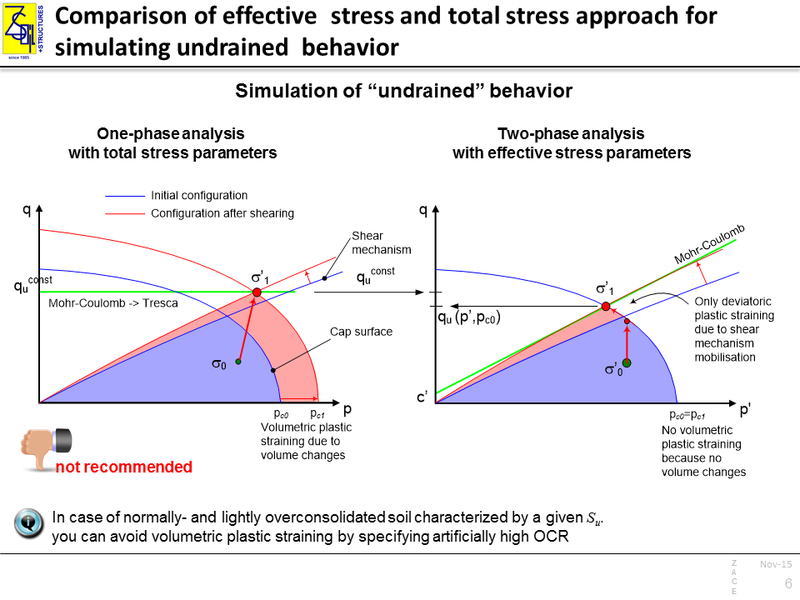 Similar assumption is adopted for the shear yield surface that expands with increasing accumulated deviatoric plastic strain γPS produced by the shear mechanism. The latter plastic mechanism may also produce volumetric plastic strain (due to dilatancy) but it is not coupled with the hardening law for preconsolidation pressure. The macroscopic behavior of cohesionless soils can be reproduced by the model reasonably well, regardless of drainage conditions (i.e. drained or undrained). 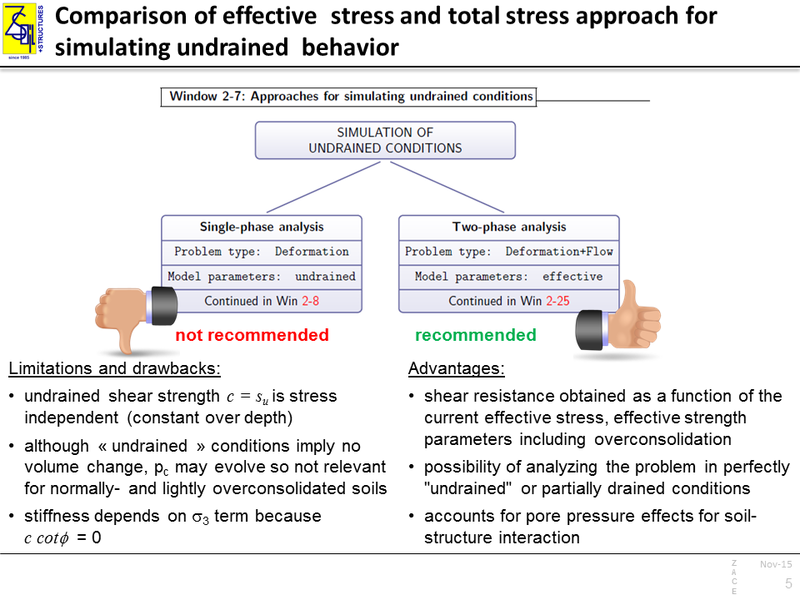 The ability to represent undrained behavior of overconsolidated, therefore usually dilative, cohesive soils is limited. Lack of coupling of these two plastic mechanisms leads to an unlimited undrained shear strength increase regardless of the OCR value. The major drawback of the model is such that it is unable to appropriately reproduce the undrained shear strength in the case when dilatancy angle ψ is larger than zero. By applying a conservative assumption ψ = 0°, the computed undrained shear strength may be underestimated with respect to the true one (even a few times for larger values of OCR). On the other hand, by assuming ψ > 0°, the undrained shear strength will tend to infinity with the increasing shear strain amplitude. The coupling of shear and volumetric mechanisms provides a general solution to the problem, it will be available in ZSoil v2016. 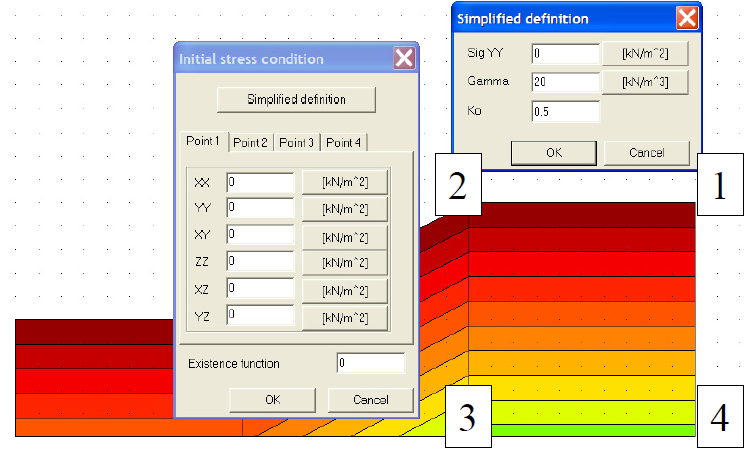 The Modified Cam-Clay model (MCC) requires an initial guess for the initial effective stress state to be set by the user. In the initial state computation hardening is deactivated and MCC behaves as classical elasto-plastic model with deviatoric flow rule. Notice that once the unloading branch, that we assume does not produce any plastic strains, is linear in e-ln(p) axes the soil stiffness must depend on the effective stresses. The bulk modulus is expressed as K = (1 + eo)/p. 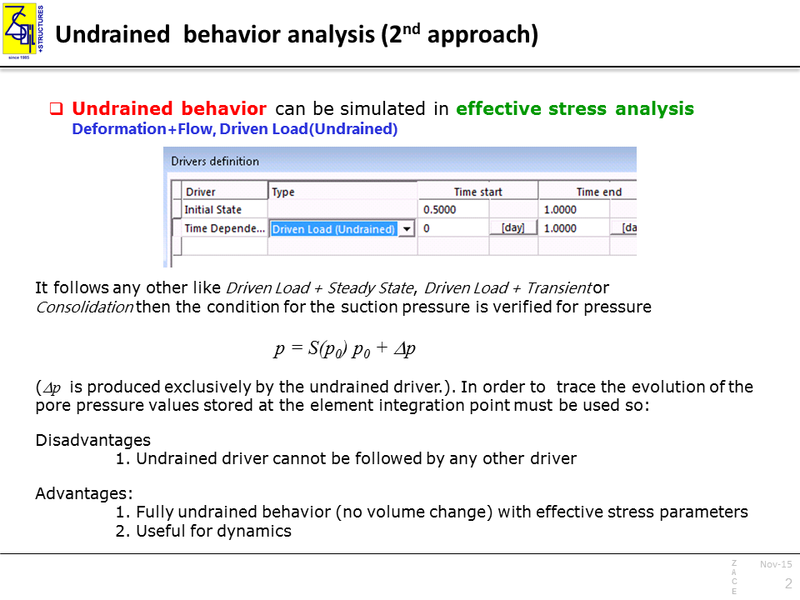 So every computation with Modified Cam-Clay model (also HSs) will require to set up the initial guess for the initial effective stress. No matter whether the initial state driver is active or not. How can we guess the initial stresses in that case? 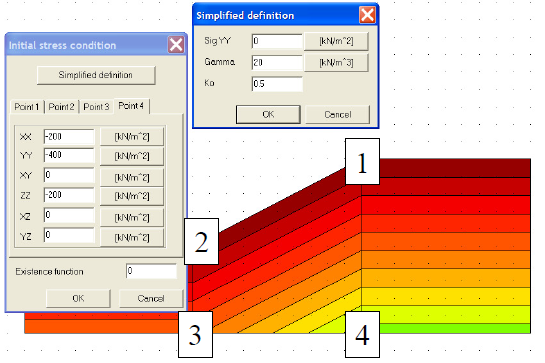 fine the in situ Ko coefficient and soil unit weight that will produce correct σo . Note that by running the Initial State driver and assuming Ko coeficient locally at the material level we do not need to be very precise when we guess the initial in situ stress state. The driver will correct it anyway.